Frederick, a site-specific installation, was created for the Sharjah Biennial 13: Tamawuj, curated by Christine Tohme Mohammed Abdallah, in the Spring and Summer of 2017. 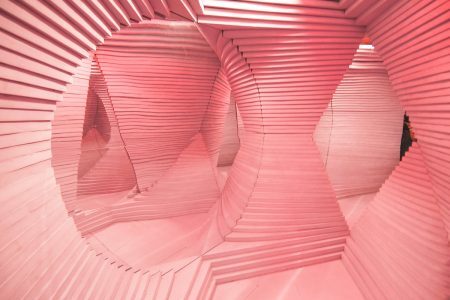 The installation is an aggregation of 90 soft shapes deployed during the March Meeting, a four day gathering of talks and performances. The shapes are suspended vertically along the gallery wall by an array of pegs. Over the course of the March Meeting the shapes migrate to the ground, gradually transforming the gallery into a play space. 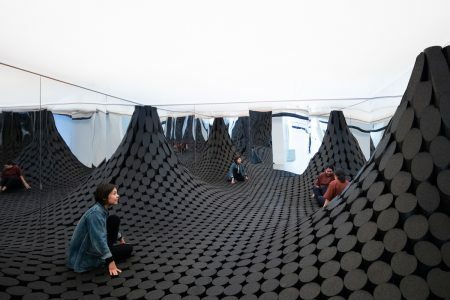 The installation suggests a sense of play and freedom, encouraging exchange and participation. The installation is inspired by Leo Lionni’s children’s book, Frederick, first published in 1967 about a daydreaming mouse that addresses social importance of art and the role of the artist in society.